All the stars aligned this past Sunday (sunny weather, healthy, and Carnival), so we hopped on a train and headed to the beachy beautiful Viareggio. And why would we go to the summertime resort in the middle of winter? To enjoy Carnival, of course! Carnival is a merry celebration, with kids dressing up, plenty of parades, and an abundance of sweets, which is akin to Fat Tuesday. Carnival is perhaps most famously known in Venice, Italy, with its elegant costumes, late night balls, and a parade held in boats. 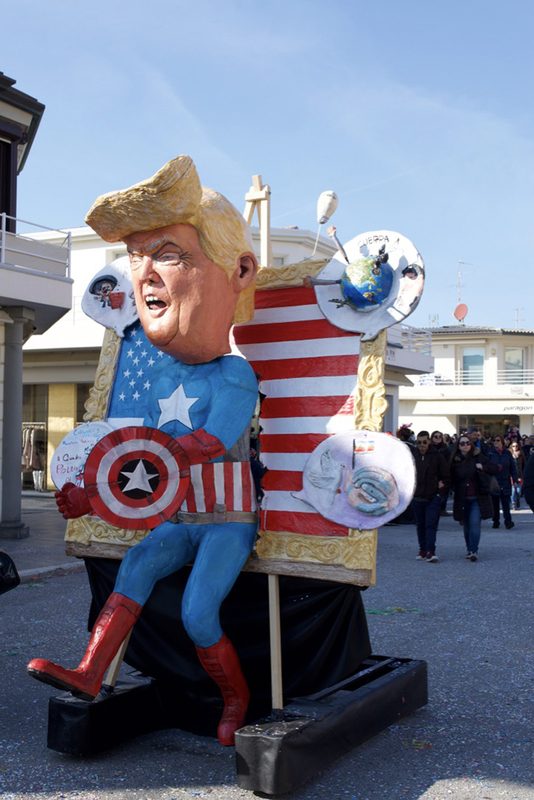 The Carnival held in Viareggio has all of these elements but is perhaps a bit more focused on both fun and making a political statement. 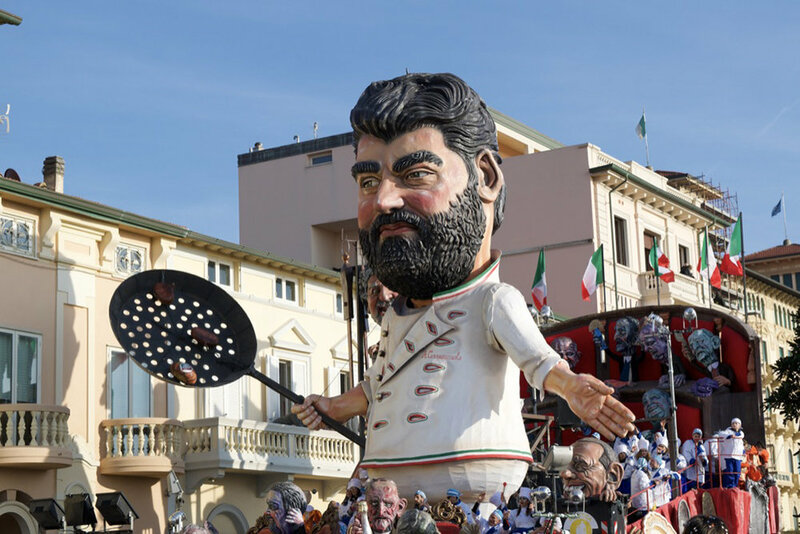 There is still time to enjoy the 2018 Carnival in Viareggio; the last parade with an awards ceremony and fireworks takes place this weekend on Saturday, February 17, 2018 starting at 5 pm. Viareggio, Italy is a small Tuscan city on the shoreline that is less than a two hour train ride away from Florence. In addition to its beautiful beach that is great to visit in the summertime, it is well-known as the largest Carnival celebration in Tuscany. 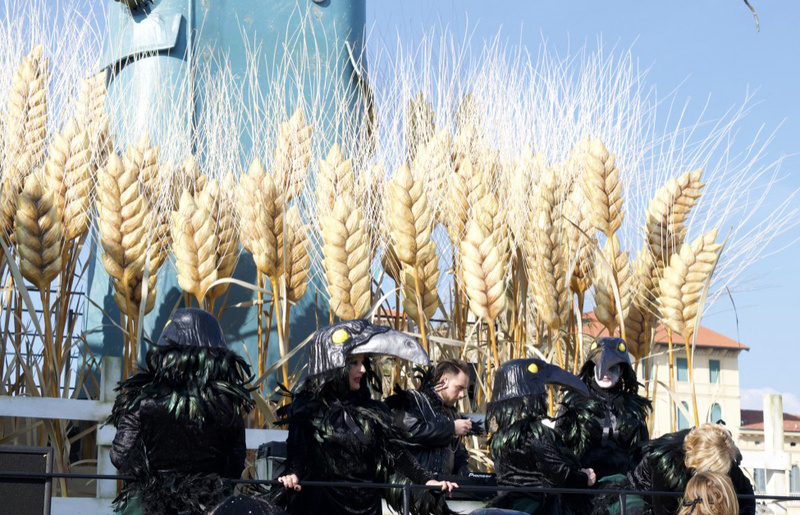 And they definitely take Carnival seriously in Viareggio, let me tell you. When you step off the train during Carnival, there is a large Carnival welcome sign with a count-down until next year's event. As you make the leisurely walk from the train station to the beachfront, you'll see streamers lining the pedestrian streets, vendors selling masks and crazy wigs, and plenty of confetti from children enjoying the celebration. Most children are dressed up and many adults have at least donned a wig. When you enter the parade area (more details about this below), you'll be able to see the impressive, very large (I'm talking more than 4 storeys tall) floats that have been handmade by local artists. When the parade starts, expect dancing, loud music, candy, confetti, and lots of fun. I thought it was really cool that even as the floats were moving and the performers were walking the streets, spectators could join in and get up close to see the parades. Unlike parades in the U.S., there were no barriers between the floats and spectators, so you could join in and really feel the energy. 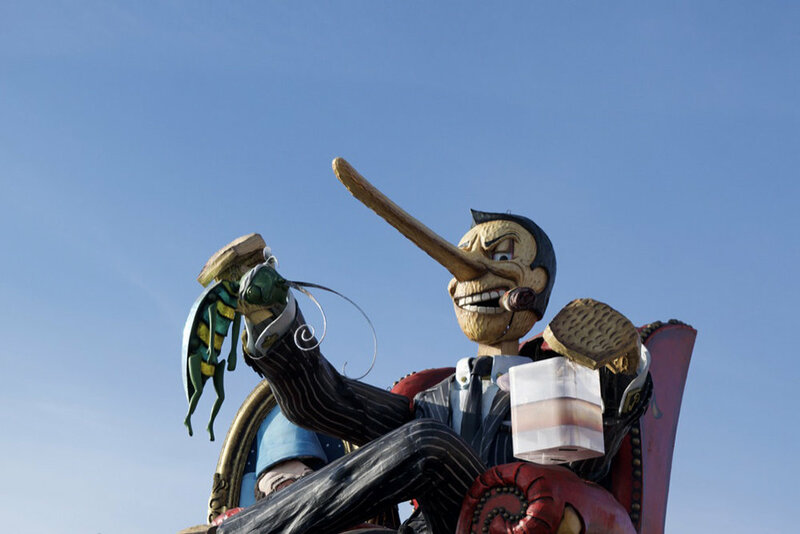 The Carnival celebration in Viareggio is the largest in Tuscany. It takes place over four weekends (sometimes held on Saturday, sometimes on Sunday) leading up to and just after Carnival (or Fat Tuesday/Pancake Day/Shrove Tuesday). This celebration is very family-friendly, and you'll see tons of kids with their parents and there is ample space for strollers while the parade goes by. The last Carnival celebration also features an awards ceremony and fireworks. Entrance to the Carnival celebration in Viareggio costs 20 EUR per person (adult) and is free for young children. If you'd like a seat in the metal bleachers, you can purchase an additional ticket for 15 EUR plus the entrance fee of 20 EUR. The tickets for the bleachers can be purchased next to the bleachers, but I'd suggest saving your money and simply walking through the streets. It is easy to see the floats as they pass by from anywhere on the street. You do have to pass through some security to enter Viale Daniele Manin on which the parade takes place. Along this street, you'll also find food vendors, beer stalls, and silly string/confetti vendors. If you hope to eat lunch in Viareggio during Carnival, be sure to reserve a table for lunch in advance. Our friends thought of this and booked us a large table, which I'm so thankful for. We ate at Ristorante Amaro Braceria on Via S. Martino, 73, which I really recommend. The staff were dressed up, the food was tasty, and it was family-friendly. It is definitely a restaurant that I'd return to. You can find the dates and information for Carnival online on Viareggio's official website. The dates change yearly, so be sure to check the website and dates for Carnival 2019, if you plan to come next year. 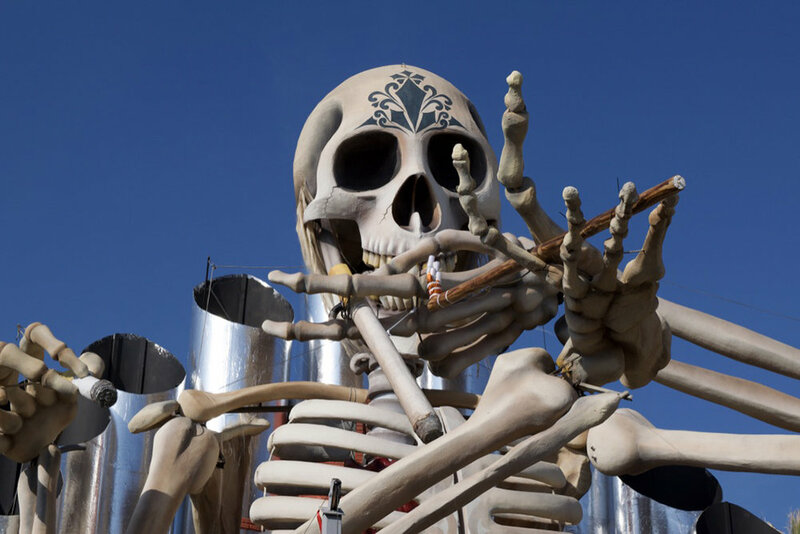 There is also a Carnival Museum in Viareggio if you haven't had enough! Have you been to Carnival in Italy before? I'm linking up with Faraway Files #64 with Oregon Girl Around The World.